Related to my affection for (or obsession with) all things comfortable, I love soup. Related to my love of all pork products, I also love ham. 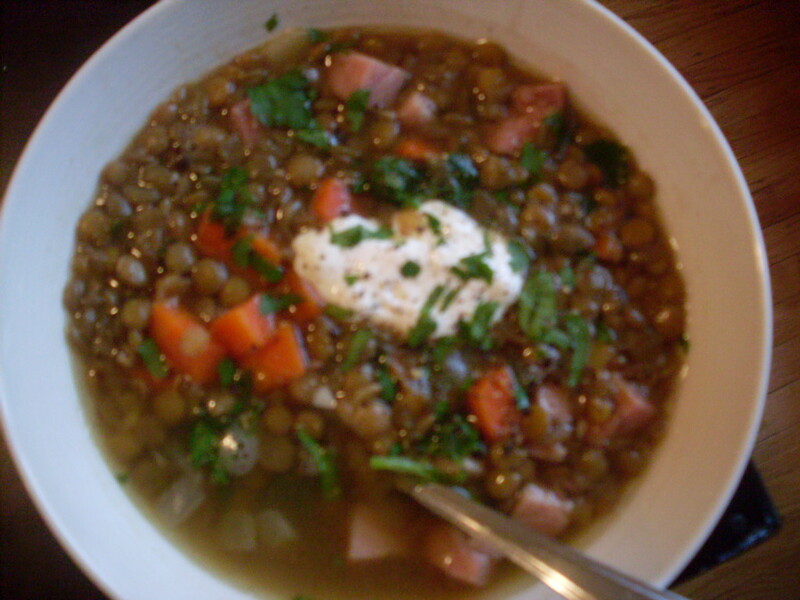 I like lentils – I would never compare my feelings about them to my passion for ham (or even comfort), but as far as legumes go, they’re pretty outstanding as well. I ended up with a lot of leftover ham this past weekend, as we celebrated my Dad’s birthday and he wanted ham for dinner. He also wanted me to take home all the leftovers, so now my fridge is full – FULL! – of ham. I got the bone too, which is a major score. I was going to make regular old split-pea and ham soup, because I love its salty porridgeyness, but Nick made a fuss and it was annoying so I caved, and decided that we’d have lentils instead. This is the soup that resulted. Try it with your Easter ham leftovers, and get cozy over a big bowl. And tell me what you think. In a large pot, combine ham bone, lentils, bay leaves, and eight to ten cups of water, and bring to a boil over medium-high heat. Reduce to medium, and cook for 30 minutes, stirring occasionally. Meanwhile, heat olive oil in a pan over medium-high heat. Add onions and carrots, and sautée until glistening. Empty pan into pot. Stir in garlic, cumin, pepper, lemon zest, and nutmeg, and continue to cook for another 30 minutes. Stir occasionally, as before. At this point, you may want to add another cup or two of water, and top up as needed to ensure your soup is a consistency you enjoy. In the last five minutes of cooking, add the ham and lemon juice to the pot. At this point, it would be wise to taste, and add any salt you need. I don’t recommend salting until almost the end, because ham is so salty and you may not need much. Just before serving, stir in parsley. Serve hot, with a dollop of sour cream and a sprinkling of additional parsley, if desired. Around here, it was a hit. And there are lots of leftovers, so I think it will continue to be a hit, right up until we take home our leftover Easter ham and have to make up another batch. < Previous Sticky toffee pancakes. Next > Radishes are the new whatever we were eating all winter. It is definitely pretty! This looks tasty and can I just say I LOVE HAM! I have to try lentils, I hear they are neatoriffic.. Thanks for the recipe! Alliedow: It was tasty! Yes, go try lentils RIGHT NOW! I love them so much. They are like little niblets of good-for-you.